In a year when Apple focused most of its energy on the iPhone 3G, matters of the cloud, and updated computers, its digital media efforts continued at a steady—and incrementally more interesting—pace. At January’s Macworld Expo, Apple took another whack at making the Apple TV more than just a hobby. Having realized that a set-top box that streams media from a computer to an attached TV and AV media system is a tough sell—regardless of whose logo is tattooed into the case—Apple attempted to give the Apple TV a leg-up by announcing that movie rentals would become a part of the iTunes Store’s catalog. 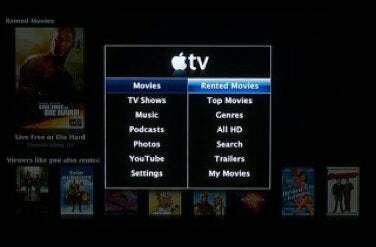 Playable on computers, compatible iPods, iPhones, and Apple TVs, these rentals would be accessible directly from the Apple TV (running the 2.0 software)—no more trotting over to the computer to download content and then sync or stream it to the Apple TV. Unlike in the past, the Apple TV Take 2 software allowed the device to play HD-quality video (720p) and 5.1 Dolby Digital Surround Sound. At that time you still had to purchase movies on your computer and then sync or stream those movies to the Apple TV—only rentals could be downloaded directly from the iTunes Store to the device. In May Apple made it possible to purchase movies on the Apple TV. Welcome as rentals were to the iTunes Store, there were a couple of flies in the ointment. The availability of content was first. Apple promised 1,000 movie rentals by the end of February but missed the mark by just over two months. The Store’s catalog increased over time to the point where, by year’s end, it boasts over 2,750 rental movies. 2008 brought movie rentals to the iTunes Store. Although the Apple TV didn’t take off in 2008, neither did any other set-top box. What did take off, however, was the notion of streaming content to the living room. Apple was certainly in there pitching, but so too was Roku with its Netflix Player and Western Digital’s WD TV. And on the Web, Boxee drew interest as a way to stream content from Hulu, SHOUTcast, The WB, MTVMusic, and NetFlix (computer only, no Apple TV support). If anyone harbored hopes that movie rentals were to presage a move to an iTunes subscription service, those hopes should have been dashed by the masses’ continued disinterest in music subscription services. In February 2008 Yahoo! Music Unlimited announced that its subscription music service was about to become very limited, as in non-existent. Yahoo’s current customers were shuttled to Rhapsody, another subscription service that has managed to survive, if not thrive. Apple’s media partners—music companies, movie studios, and TV networks—continued to search for ways to lessen Apple’s dominance in the media market. NBC Universal and Apple continued their contentious spat where, in 2007, Apple dropped NBC’s television programs from the iTunes Store after the broadcast company made threats to depart if certain pricing and bundling demands weren't met. NBC eventually returned in September 2008, when Apple began offering its and other networks’ TV shows in HD. While the broadcasters’ efforts brought greater popularity to outfits such as Hulu (a site for streaming TV shows and movies) and NetFlix (which offered streaming content in addition to its disc-in-the-mail business), they had very little effect on Apple’s dominance. iTunes became the number one U.S. music retailer in 2008. And just how dominant was the iTunes Store in 2008? In April the NPD Group’s MusicWatch survey pronounced iTunes the number one music retailer in the U.S., beating out Wal-Mart for the first time. By mid-2008 iTunes had sold over five billion songs during its five-year lifespan. The iPod, once a miracle music machine, has become a bread-and-butter staple in Apple’s product line. So much so that you can nearly set your watch by autumnal events that announce new iPod models for the holidays. This year was no exception as Steve Jobs took the stage on September 9 to announce updated models of the 2G iPod touch, 4G iPod nano, and 2G iPod classic. While there he introduced iTunes 8, a version of Apple’s ubiquitous music player, most notable for its Genius playlist-creation feature.